Social media, a large portion of emerging media is now having a larger role in the nations educational system. 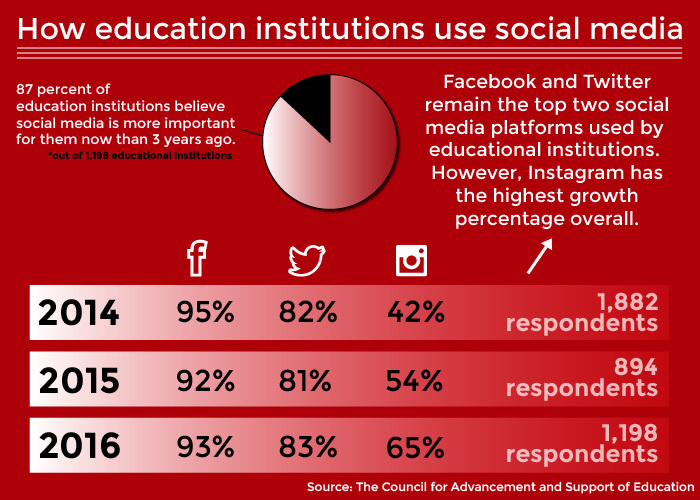 In many cases, social media was found to be more important to school systems by a margin of 86%, this is a large increase from just three years ago. Facebook, Twitter, and now Instagram are the three top platforms for schools. Tools like these platforms now play a key role in the ability for teachers to easily and more effectively communicate with their students and from a marketing prospective these media platforms play a huge role in attracting students to universities all over the country. While the three platforms highlighted are leading the way today in the newest forms of emerging media, years, months, or even weeks from now there will more than likely be newer, and much more advanced platforms made available to people that will make these platforms seem like things of the past, just as these platforms have made things like email, instant messaging, and other forms of media rather antiquated in the whole scheme of things. My mother taught at a local high school for many years and was before the time of social media. I would like to think that Mom would have embraced social media as a way to teach her students. Also, the high school that Mom taught at is a private school that should use Facebook, Instagram, and YouTube to attract students to the school. They are still using billboard and television advertisements to attract students.